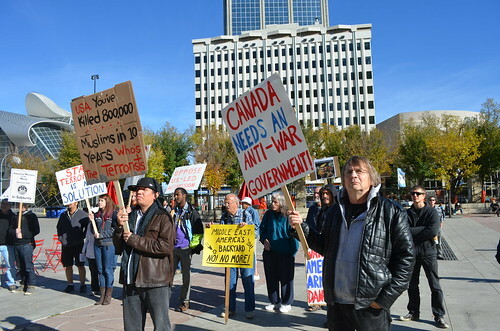 On October 6, I was privileged to take part in an anti-war rally with my colleagues of the Edmonton Coalition Against War and Racism (ECAWAR). It was the International Day of Action entitled Hands Off Iran! Similar rallies across the country called for the Canadian government to end its current sanctions against Iran and not to go to war with that country. ECAWAR expanded that mandate to also call for an end to sanctions against Syria and for Canadians to press for a true anti-war government. Why end the sanctions? Sanctions against a country is usually an early step in an escalation leading to full-on military intervention. ECAWAR believes in the right of self-determination for all countries, and for diplomatic rather than military solutions. A couple of days after the rally I got an email from someone who attended, asking why we would also want to end sanctions against Syria, with its tyrannical leader who is mercilessly slaughtering people there. Supporting the right of self-determination to the people of a country does not mean that we also support the leadership of that country or condone its actions. Sanctions tend to hurt the people of a country more than the leaders. And if there is foreign military intervention with the intention of removing that government, it will lead to the deaths of thousands of civilians (just like in Iraq and Afghanistan). I have also been challenged a few times on the issue of Iran because, after all, they are making nukes. Really? Like those weapons of mass destruction that were never found in Iraq? Like the ones in the United States - the country with the most nuclear weapons in the world? Oh, but Iran is going to use those weapons against Israel. When it comes to the Middle East, Israel has had nuclear weapons for years - it may be a small country, but Israel can certainly take care of itself. The truth of the matter is (and I am going to paraphrase a meme I found on Facebook the other day): if there is war in a country and a US drone kills a child, the father of that child is going to go to war against the US, regardless of his religion, affiliation, or ideology. Violence begets violence and war begets war. It's a cycle we need to break.